Long gone are the days where brides had no choice but to wear thick, face-covering veils or sparkly princess tiaras on their special day. Headbands are the new “it” accessory, gracing all the current wedding magazine covers and online wedding hair tutorials, being the finishing touch on numerous hairdo masterpieces. Brides and bridesmaids alike are shifting to this new style, which is perfect for anything from a light, airy beach wedding to a rustic country celebration. Check out seven of the most popular wedding headbands for today’s brides and bridesmaids. A favorite for brides seeking to add a touch of Hollywood glamour to their celebration, these types of lace wedding headbands are just the right combination of delicate femininity and class. Paired with a birdcage veil, this look is perfect for brides who seek to add an old-world romantic feel to their weddings. What’s more, lace adds a sense of grace and timelessness to any look. This type of headband would pair especially well with a dress that includes similar elements in its design. Bridesmaids can wear a lace piece without the birdcage veil, or opt for a smaller, thinner lace headband, like that seen here. Some brides opt to decorate their weddings in an abundance of floral patterns, from the garlands adorning the ceremony walkways to the accessories they wear. For those brides, as well as their bridesmaids, colorful floral wedding headbands like this one would be the ideal finishing touch. Nonetheless, if a bride desires a more neutral color scheme, a floral headband in white, ivory, or pink tones would be just as stunning. This look is especially fitting for weddings where nature plays a big role. Whether the wedding itself takes place in a forest, or the bride and groom simply wish to go for a minimalist, a natural approach with some real plants is a nice touch. 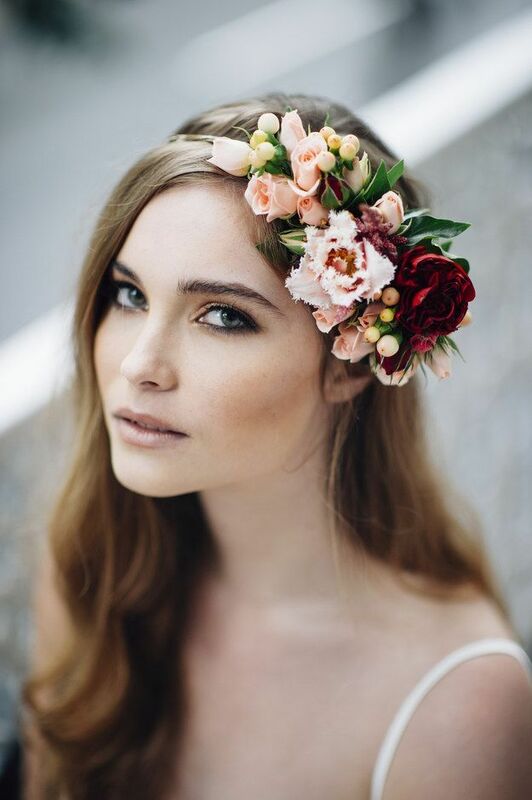 Bridesmaids can accomplish this look with a smaller floral headband or crown, like this one. For brides who want to go with a more pronounced, flashy approach to their accessories without having to resort to wearing a princess tiara, wedding headbands like this one, featuring rhinestones and crystals, are definitely the best way to achieve this look. In weddings where glitz and glamour are the goals, brides and their bridesmaids can wear headpieces featuring Swarovski crystals, luminous beads, and other rhinestones. This will maximize the shine factor and present a truly dazzling image that will stand out both at the event and in future photographs. Bridesmaids can also opt for a smaller bejeweled headband, like this one. Beach weddings are all the rage right now, especially in spring and summer. As a result, for a beachy bridal headpiece, what could be more appropriate than a headband with seashells? Ocean-themed wedding headbands like this one are making waves on craft sites like Etsy, and brides can now opt for this style to accompany a simple, flowing gown and sandy beaches. Light, airy beach celebrations call for a more “effortless” look. Therefore, some tousled waves with a seashell headband would be the perfect way to achieve that style. Bridesmaids can also adorn themselves with seashell-themed headpieces similar to this one. A rustic country wedding or a wedding inside an ornate church calls for a traditional, vintage-inspired bridal look. Wedding headbands with art deco motifs and vintage designs like this one are ideal for such an occasion. Antique styles are timeless, and when paired with classic color combinations and traditional décor, together they produce a truly picturesque wedding celebration. Vintage headbands come in many shapes and sizes, from small and understated like this one (perfect for bridesmaids), to medium-sized like the one pictured above, to large and grandiose like this Gatsby-themed one. Each headband has unique elements that would make it appropriate for different wedding styles. Consequently, brides seeking a vintage-inspired headpiece can easily find one to fit their tastes and their budgets. 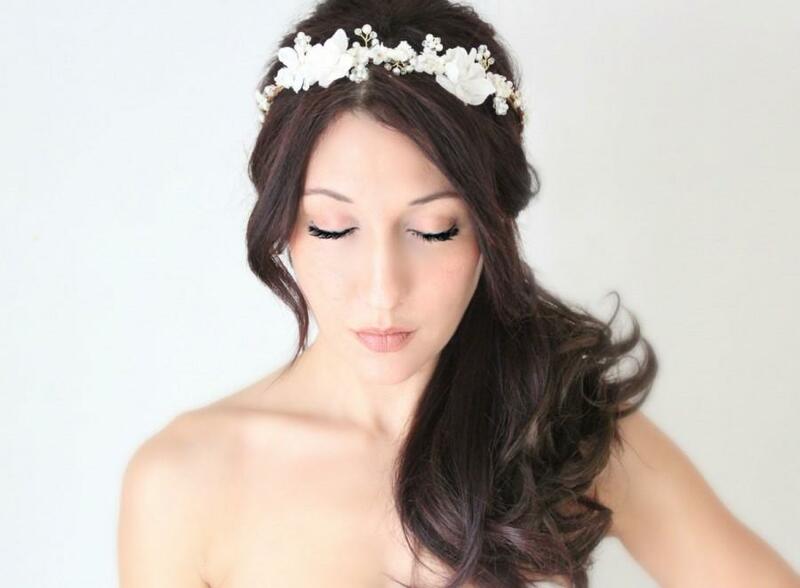 A recent style that has emerged and taken the bridal world by storm is the “hair vine” headband. This was intended to snake its way through the bride’s hair. Consequently, it brings out little pops of sparkle in different places. Hairpieces of this style can suit a wedding with any theme, from boho chic to glitz and glamour galore. The best part is their versatility. These wedding headbands can be carefully weaved through hair while it is down. Alternatively, they can be placed like a crown around the head while the hair is up in a bun. Bridesmaids can wear a smaller hair vine, like this one. Any bride looking to add an eclectic splash of excitement to her wedding attire can rest assured that a feathered headband will do the trick! While this style is commonly seen in weddings with a 1920s “flapper” theme, feathers can add a cool twist to any kind of wedding celebration. Furthermore, feathers are flirty and fun, but still classy enough that they can be tastefully paired with a long, beautiful ball gown or shorter party dress. Bridesmaids can sport a feathered headband like this one to complete their looks. There is a wide variety of bridal headwear on the market today. The items described above are some of the most popular headband styles available. The important thing is to find what suits the bride and makes her feel gorgeous on her special day! What is your favorite style for bridal headbands? Is there a new trend that you would like to mention? Let us know in the comments!